After such a glorious day on Saturday both Hanna and I had high expectations of a sunny ride down to Hayle. Unfortunately we woke up to find overcast skies and a light drizzle. Therefore we were duly surprised by the turn out when we arrived at the Piazza to find eight willing volunteers ready to roll. This included two guests who were down on holiday (poor souls…). We left Truro via Richmond Hill and on to Threemilestone at a steady pace and it was becoming obvious that our guests had expected some proper cyclists rather than the usual old boys. Down through Greenbottom and onto Bissoe and once we hit Combe Hill reality stepped in with the A Team comprising our two guests plus hanging on to their shirt tails were Tom B and Thom G. The B Team eventually made it to the top to regroup. Onwards to Carrick and Lanner where Rod decided sense was the better part of valour and returned to Truro. Then on through Four Lanes and Black Rock where the clag and drizzle made the visibility a little testing to say the least. Once we reached Praze-an-Beeble the visibility returned to normal. The A team now stepped up a gear and left the B Team in their wake after Leedstown. The proposed route was via St. Erth to Lelant. However, the A team missed the turning as the ride leader and his compatriots were well to the rear. We duly stopped at the St. Erth junction to allow Dave B to call No 1 son Tom to ascertain their position, unfortunately Tom failed to answer so the B Team had no alternative but to plod on to Hayle where we caught the A Team patiently waiting. Through Hayle and onto our lunch/coffee stop at the Wyevale Garden Centre. Following lunch we went through Hayle along the cycle path and eventually leading to Gwithian and up one of the ride leader’s less favourite hills (Strava segment Sandsifter to Hells Mouth Café) and onto Portreath where the A Team duly waited at the beach turning. Onwards towards Truro the B Team with Thom decided to take the Mawla route home. Unfortunately we never saw the A Team again – disappeared into the afternoon mist. 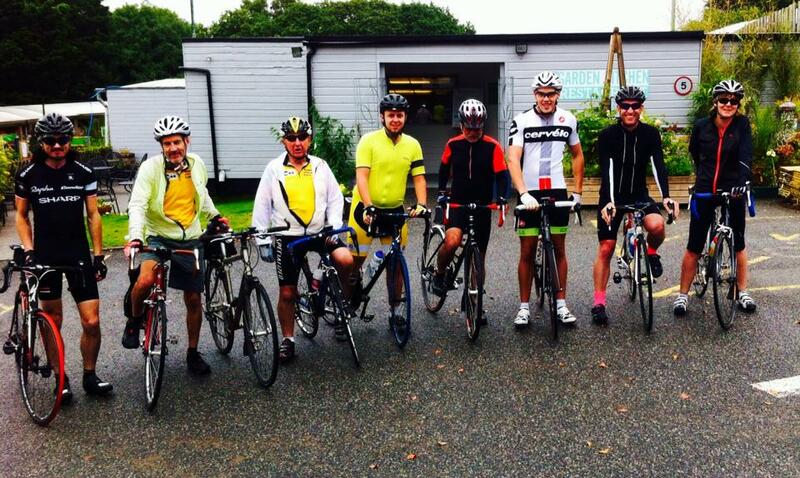 Riders at the Wyevale Garden Centre cafe. A Team : Josh Soper (guest), Tim Peters (guest), Thom Green, and Tom Bennett.